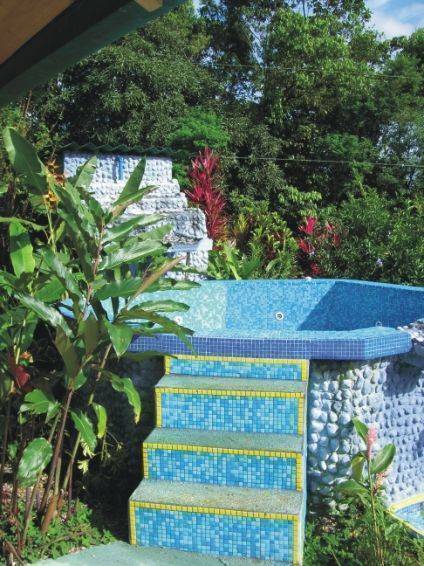 The hotel, under German management, is located in the south of Costa Rica's, at only 1. 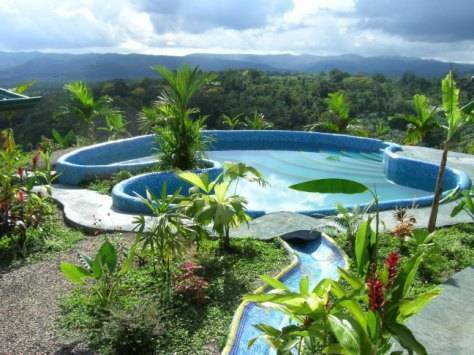 5 kilometers distance from the "Interamerican Highway" and all year round accessible by car. 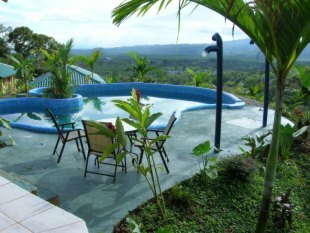 The fantastic panorama view location at the ascent to the "Cerro de Paraguas" (umbrella hill), close to Piedras Blancas national park, at the old road between Río Claro and San Vito, offers all amenities to our guests. 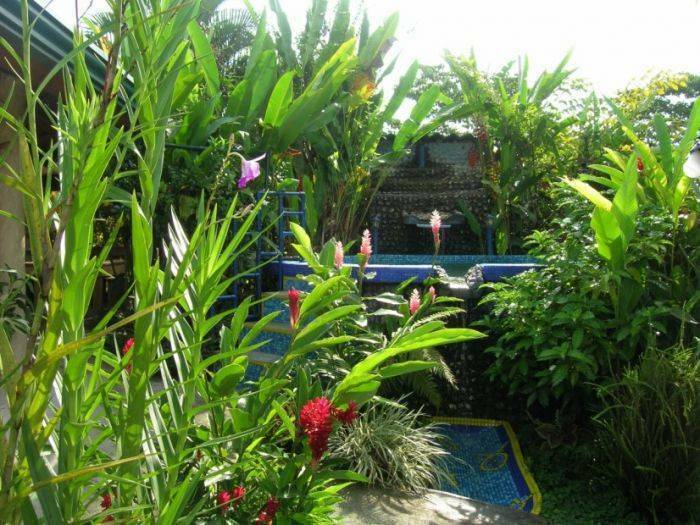 The harmoniously colored installation, integrated into to a tropical garden, has 16 roomy housing units in eight individual bungalows. This small village at 4. 000 qm2 although includes a special for our hotel designed pool and Jacuzzi with waterfall. Tropical ambience will find our guests at the rancho style breakfast and special event restaurant. 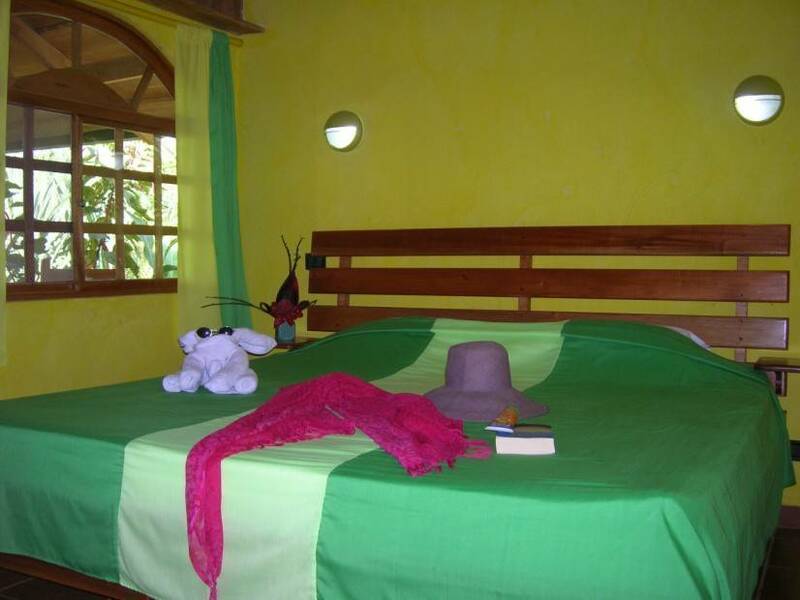 Our bright, airy rooms with mosquito net, air conditioning and private terrace are completely tiled and equipped with natural wood furniture from ecological plantations. A King Size, a single bed, a small three-piece suite and an open wardrobe are harmoniously integrated into each room. A small refrigerator/mini-bar and a safe box make sure that our guests can feel "as at home". Each bathroom has a hot water shower and separate toilet with hand washbasin. Wireless Internet are available at the restaurant used as reception and information point, too. As a special service for our guests, we offer free coffee in the morning starting at 6. 30 a. m. for the early birds. We do offer laundry service on request. This small village at 4. 000 qm2 although includes a special for our hotel designed pool and Jacuzzi with waterfall. Tropical ambience will find our guests at the rancho style breakfast and special event restaurant. Our bright, airy rooms with mosquito net, air conditioning and private terrace are completely tiled and equipped with natural wood furniture from ecological plantations. A King Size, a single bed, a small three-piece suite and an open wardrobe are harmoniously integrated into each room. A small refrigerator/mini-bar and a safe box make sure that our guests can feel "as at home". Each bathroom has a hot water shower and separate toilet with hand washbasin. Part of the hotel is an actively managed palm farm on 22 hectares, which was settled at the area of a former cattle farm and no rain forest was cut down. By foot or by horse our guests can observe the weekly harvest with the typical ox car. The fruits of the oil palm (Elaeis guineensis) are converted to cholesterol free oil. All participants can cool down later in our nature pool from "Rio Chiricano" river before they start there back to the hotel. We will be glad to arrange horseback tours into the closer environment of the hotel with a local guide visiting a waterfall or the "Cerro de Paraguas" (umbrella mountain), which offer amazing panorama views to the "Golfo Dulce" (Sweet Gulf) and Panama. Rio Claro has a bank, gas station, pharmacy, supermarket, Internet cafe and different bars and restaurants. Our strategically location to the "Interamerican" highway, only 1. 5 kilometers, offers a multiplicity of excursion possibilities and we are glad to help our guest with the reservation. We recommend this route, because is shorter and the roads are in better conditions. In Río Claro stay on the Interamerican highway and keep driving direction Paso Canoas-Border Panama. At the fourth intersection after the gas station in Rio Claro you will see a sign for the Hotel Palmeral Dorima on the right hand side and at the left hand side you will see a Yamaha motorcycle shop. Take this intersection and follow the road 1, 5 kilometers more to the hotel. The trip takes aprox. 4, 5 hours from San Jose and 2 hours from Manuel Antonio.